What does it take to be a winner? A few years ago, CustomerCount® and Resort Trades collaborated to explore how this question applies to the resort industry professional. Is it a matter of skills and training? How about an innate love of people and understanding the value of what a vacation brings to them? Does a person’s ability to make connections with others give them that special something? Perhaps we can explore these questions further by taking a look at the 2018 winner of the CustomerCount Customer Engagement Professional (CEP) Resort Trades Award. Taking the first-place trophy was Noyan Suel, Operations Manager of Grand Pacific Resorts’ Carlsbad Seapointe Resort. The trophy, itself (pictured here), is an elegant, engraved, 3-foot-tall, lead crystal award. Plus, in recognition of their excellence in training and mentoring Noyan, an additional trophy will be awarded to Grand Pacific Resorts for its culture of fostering customer engagement professionals. Noyan was selected from a group of exceptional finalists. The worthy runners-up in this elite group were: Sylvia Bawl, Rental Agent, Timeshares Only; Rhonda Swain, General Manager, Cunningham Property Management Corporation; Lacey Sauls, General Manager, The Greens at Bella Vista Resort; and Kelly Hancock, Assistant General Manager, Southwind Management, Spinnaker Resorts, Royal Floridian Resort. “The nominee exudes integrity and consistency for his role as Operations Manager at the resort, and his enthusiasm trickles down to every layer of the organization,” the judges were told. Noyan’s energy appears to be boundless as he simultaneously manages another property, and that, in a different state! 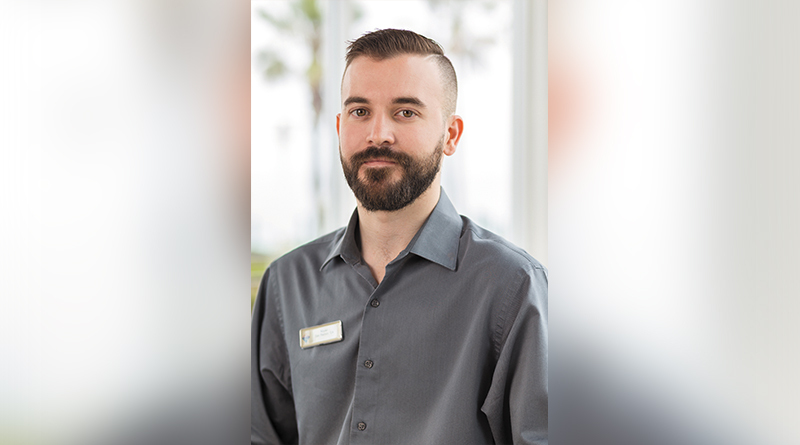 When referring to him, his peers often mention the word “respect.” For example, whenever he’s called upon to step in as Seapointe Resort’s interim general manager, the staff has a great deal of respect for him. He is known for operating on a foundation of mutual respect and trust, and is ready to work where help is needed the most, even when it comes to pitching in housekeeping duties on extra-busy turnover days. He is known for fostering growth for his associates by providing training opportunities and instilling confidence in them. Plus, respect is evidenced further when he treats and trains guest services agents as if they were supervisors. They appreciate the empowerment and hands on training. Being a ‘can-do’ person and using creative thinking can set you a head above the rest. Noyan uses creative thinking to find solutions. You might say he begins with the end in mind. For example, during a time of financial streamlining, the nominee dredged through budgets, salaries, roles, responsibilities, and operational reports and came up with ideas that ultimately saved the resort $60,000 annually. He was careful to take into account the guest experience and made sure there would be zero adverse effect in that regard. And speaking of guest experience, he takes each guest’s and owner’s vacation personally and strives to ensure that they have a positive one. Noyan learned the hospitality business from the ground up. Noyan worked as a Medical Assistant at a local community clinic for six years and invested three years in higher education. He recognized that opportunity for advancement in that field would always be inhibited by the time and financial investment in the required advanced degrees. Growing up, Noyan would visit an iconic hotel in San Francisco where he was mesmerized by the dynamic energy. He decided to pursue the draw he always felt as a child by making a career in the hospitality industry where advancement opportunities are available to those that are passionate and willing to put in the work. The Trades Publishing Company, publishers of Resort Trades. the Resort Trades Weekly eNewsletter, and webmasters of ResortTrades.com, has been proud to co-sponsor this important recognition with CustomerCount since 2016. The team at The Trades is very impressed with CustomerCount’s advanced technology; the way they are able to capture and interpret information has been proven to capture a depth of information that a written survey never could. The company’s cloud-based survey solution provides intuitive real-time reporting, which enabled our judges to make informed decisions accrued from an incredible amount of data. Nominees were rated on extraordinary interactions with members/guests; remarkable improvements in on-site ratings of the resort; innovative training techniques and outstanding social media mentions and reviews. Nominations also included detailed insight regarding the leader’s performance and contribution showing how the nominee’s efforts and achievements have significantly impacted the team, company, and/or community. Georgi Bohrod is the founder of GBG & Associates a firm specializing in the seamless integration of multiple marketing and public relations toward the effective fulfillment of client business goals. The company has created and implemented a wealth of strategic marketing, advertising and public relations programs for hotels, timeshare resorts, resort developers, small businesses, service providers and travel industry corporations. Under Bohrod’s leadership, the company has won countless awards for collateral material design, interactive media design and public relations. Sharon Scott Wilson is Publisher of Resort Trades and Golf Course Trades magazines. Her firm, SharonINK – providing clients with B2B and B2C content – recently became a subsidiary of The Trades Publishing Company.